↑ "Kenyatta wins Moi party election", BBC News, 1 February 2005. ↑ Africa | 'Coup' in old Kenyan ruling party. BBC News (2006-11-29). Retrieved on 2010-12-20. ↑ Africa | Police tear-gas Kenyatta protest. BBC News (2006-12-05). Retrieved on 2010-12-20. ↑ "Kenyan opposition leader's position upheld"[স্থায়ীভাবে অকার্যকর সংযোগ], Associated Press (IOL), 29 June 2007. 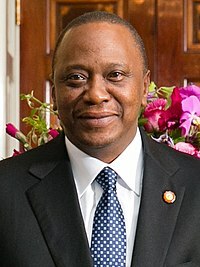 ↑ "ICC-01/09-02/11: The Prosecutor v. Francis Kirimi Muthaura, Uhuru Muigai Kenyatta and Mohammed Hussein Ali Decision on the Prosecutor's Application for Summonses to Appear for Francis Kirimi Muthaura, Uhuru Muigai Kenyatta and Mohammed Hussein Ali" (PDF). International Criminal Court. 2011-03-08. Retrieved 2011-03-08.